In 1947 stereotactic neurosurgery was developed, reducing considerably many post-operative adverse effects and complications. 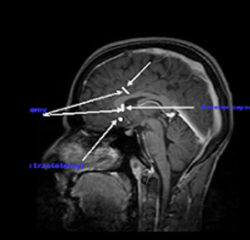 Since then, different centers have started to employ several stereotactic techniques, such as anterior cingulotomy (US), capsulotomy (Sweden), subcaudate tractotomy and limbic leucotomy (England and Australia). Afterwards, Leksell simulated capsulotomy lesions focusing gamma rays beams emitted by Cobalt-60 radioactive isotope on the internal capsule. Large number of surgeries was performed during this time i.e. during 1940-1960s as there was no medical treatment for these disorders. However, with the availability of newer drugs the number of surgeries decreased. Recently, due to the better understanding of the disease and improved safety of surgical procedures, the interest in surgical treatment has reappeared. Appropriate selection of patients for surgery remains a major issue and the responsibility of the psychiatrist, guided by the informed and expert opinions of the other members of the psychosurgical team. Ethical objections of psychiatric neurosurgery are addressed in all centers by ensuring an informed consent from the patient and family. This is defined as adequate trial (>3 months) with maximally tolerated doses of at least three serotonin reuptake inhibitors (SRIs), one of which has to be clomipramine. Trials combining an SRI with additional medications (including a neuroleptic and a benzodiazepine) should also be tried. lesions of limbic or paralimbic territories or interruptions of their connections with deeper brain structures. Although many psychosurgeries have been done in the past, the following four procedures have evolved as the safest and most effective. They are all performed using modern stereotactic conditions to allow for the precise identification and accurate lesioning of the target structures. The contemporary procedures are anterior cingulotomy, sub caudate tractotomy, limbic leucotomy, amygdalotomy and anterior capsulotomy (and its neighboring structures). All these procedures involve lesions of limbic or paralimbic areas or interruptions of their connections with deeper brain structures. The pre surgery evaluation must be performed by committed multi-disciplinary teams with expertise and experience in the surgical treatment of psychiatric illness. Diagnosis based upon a formal classification scheme is essential. All centers with experience emphasize the importance of rehabilitation post-operatively and the need for ongoing psychiatric follow-up. It appears that many patients are greatly improved after surgery and the complications or side effects are few. Two methods of surgery are employed for altering these targets. One involves performing lesion and the other involves stimulation of these targets using deep brain stimulation (DBS). In a lesion, a radio-frequency unit is used to produce (destroy) a thermal lesion of calculated volume. This is permanent and irreversible. In DBS, an electrode is implanted at the site of the target and current is delivered through a pacemaker to alter the signals emanating from the target. The pacemaker is implanted in the infraclavicular region over anterior chest wall and is connected by extension wire that are tunneled subcutaneously to the electrodes that are implanted in the brain. The amount of current and thereby the stimulation or the inhibition of the target site is controlled by an external programmer. DBS offers an exceptional benefit of reversibility and titrability. Both these procedures are performed using stereotactic techniques, which offer a high degree of accuracy (within 1–2 mm). Recently, US Food and Drug Administration (FDA) under humanitarian device exemption category approved the use of DBS for OCD.